Tooth decay and cavities are caused by bacteria that live in plaque. These microscopic bugs feed on natural or processed sugars and create acids that decay teeth. 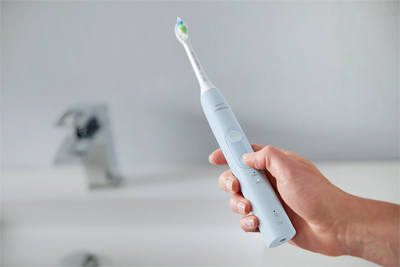 Brushing twice a day with an electric toothbrush such as the Philips Sonicare ProtectiveClean 4300 removes up to 7x more plaque than a manual toothbrush and reduces the chance of missing areas from rushing your brushing. By effectively removing plaque from the teeth twice a day, bacteria won't have a chance to damage your pearly whites! Prevention is the best way to avoid tooth decay and cavities as you age. Staying hydrated has been linked to maintenance of skin health, gut health, sleep quality, and you guessed it – oral health. As we age, a common symptom is dry mouth, caused by reduced saliva production. Saliva remineralises, cleanses and protects your teeth, a lack of saliva will lead to a build up of plaque, sugar and acid which can increase your chance of cavities, gum disease and a swollen tongue. Try to get into the habit of regularly drinking water to keep your mouth and body hydrated. Chewing sugarfree gum or lozengers can also stimulate saliva production and facilitate saliva's protective effects to keep your teeth healthy and strong. Flossing is an essential step in your daily oral health routine that is easily forgotten. Gum disease is largely preventable through effective dental care. The consequences of neglecting to floss for your adult life are decay, pain, infection and eventual tooth loss, the issue for most of my patients is the inconvenience of the process, especially those with kids or especially hectic mornings. Talk to your oral health professional about how to floss effectively, and give it your best shot. If it's just not happening, The Philips Sonicare AirFloss Ultra is a great alternative I recommend in my practice. It removes 99.9% of plaque and cleans all the areas between your teeth in just 60 seconds. As a youngster, habits learned early on can set you up for a lifetime of healthy teeth. As you age, check-ups become increasingly important. You might not notice or think twice about persistent sores, ulcers or colour changes in your mouth, but these could signify serious conditions such as oral cancer, and are screened for by your dentist at check-up appointments. Any restorations such as fillings, veneers and crowns have a lifeline of 5-15 years and need to be checked and maintained by a dentist. Nowadays life is hectic, instant, convenient and always-on, we are hyper-productive but easily distracted, and this tricky combination leads both to stress and the ability to suppress and ignore it. Interestingly, your mouth shows signs of this stress often before we are aware of it. Night-time and day-time tooth clenching, grinding, severe facial tension and headaches are almost at epidemic proportions This places large amounts of stress on the teeth can crack and wear away enamel, strain the jaw joint and increase sensitivity as well as causing head, jaw or ear aches. If you experience any of these symptoms, you should see a dentist to talk about the best treatment for your condition which could include stress management and relaxation therapy, a bite splint mouthgard to wear at night, or even muscle-relaxant injections in severe cases. Written by Dr Rick Iskandar, Owner and Principal Dentist at Tailored Teeth Dental & Cosmetics in Burwood.